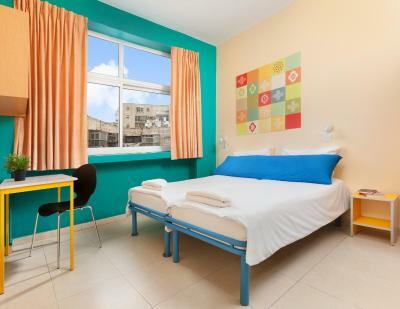 Lock in a great price for Abraham Hostel Jerusalem – rated 8.5 by recent guests! Loved the vibe! Loved the location! We walked everywhere and enjoy the many outdoor cafes. Loved the variety of people. Most of the staff were incredibly helpful and friendly. We appreciated their suggestions. 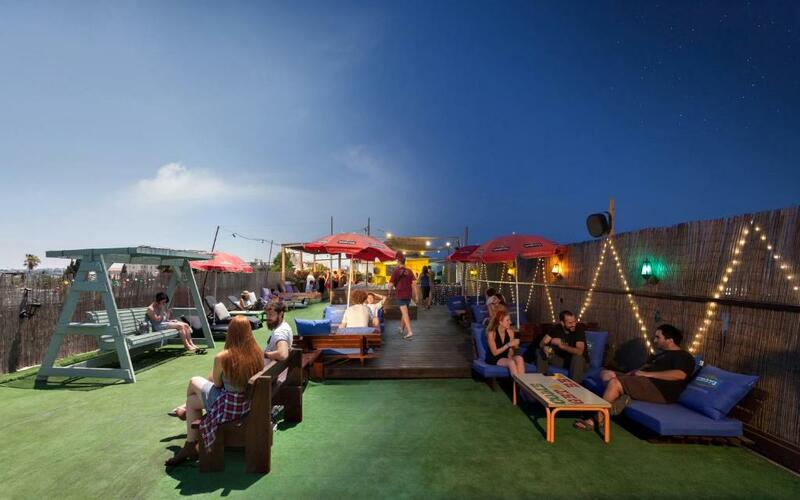 The location is great - 20 min walk from the old city, 5 min from the Mahne Yehuda market..its just near everything... also the place was very clean. Disappointing stay at Abraham Jerusalem. Coming from their great facility in Tel Aviv, the one in Jerusalem is far from having the same standards. Old furniture, noisy and cold rooms and cleanless more than average. You are allowed to expect more when you pay such a significant price per night. The location at Davicka Square is ideal as it about three blocks from the old city and two blocks from the central bus station. The staff is great and the place is clean. It's very close to the market. I stayed there for five nights, not one. The staff was wonderful, especially the manager. Location was excellent. No fluffy eggs or mattresses but the staff was helpful and the other guests in my room were pleasant. We loved everything about our stay! The shabbat meal was one of my favorite experiences here. We played the open mic and it was amazing as well. The staff are so friendly and inviting. We would highly recommend staying here if you are in Jerusalem. It's in walking distance from everything. Love this place! Just a convenient place to stay. 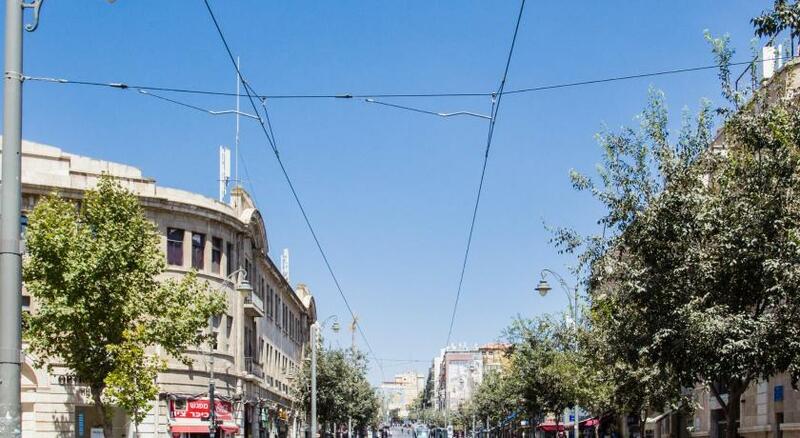 Walking distance to the markets and also to the free walking tour around the old part of Jerusalem. 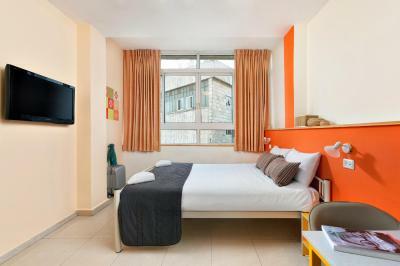 The Abraham Hostel Jerusalem is located in Davidka Square, 1,150 feet from Mahne Yehuda Market. 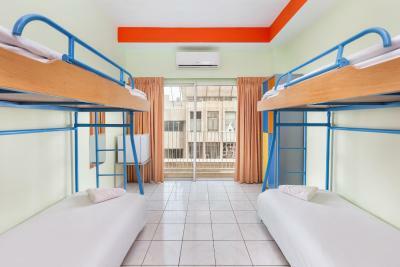 It offers rooms and dormitories with free WiFi and air conditioning. A continental breakfast is provided at the Abraham, and a communal kitchen is available for guests' use. The hostel features an evening bar with a selection of Israeli beers and nightly entertainment. The tour desk can organize excursions in Jerusalem and to different destinations in Israel. 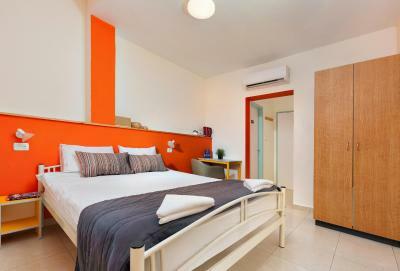 When would you like to stay at Abraham Hostel Jerusalem? 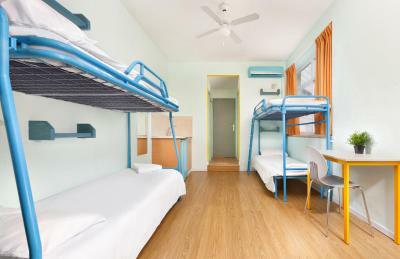 Guests younger than 18 years of age cannot be accommodated in this dormitory room. 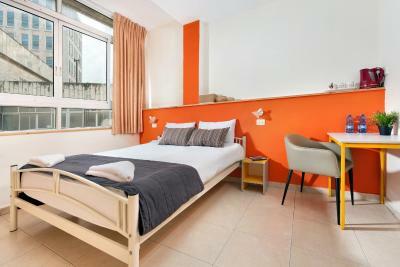 We offer 72 en-suite rooms, both dorm (mixed & female) and private rooms. All rooms include a/c and a mini-fridge. Our great facilities include a large guest kitchen, lounge, and bar, free wifi, Tv room, rooftop, activities and a travelers center. Wired internet is available in public areas and costs ILS 10.38 per hour. 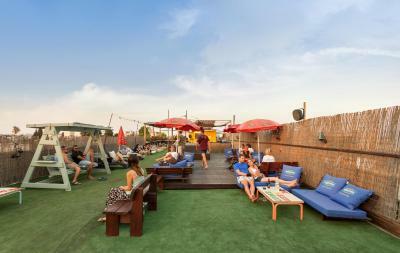 House Rules Abraham Hostel Jerusalem takes special requests – add in the next step! All children under 12 years are charged ILS 65 per night for extra beds. Any additional older children or adults are charged ILS 65 per night for extra beds. Abraham Hostel Jerusalem accepts these cards and reserves the right to temporarily hold an amount prior to arrival. 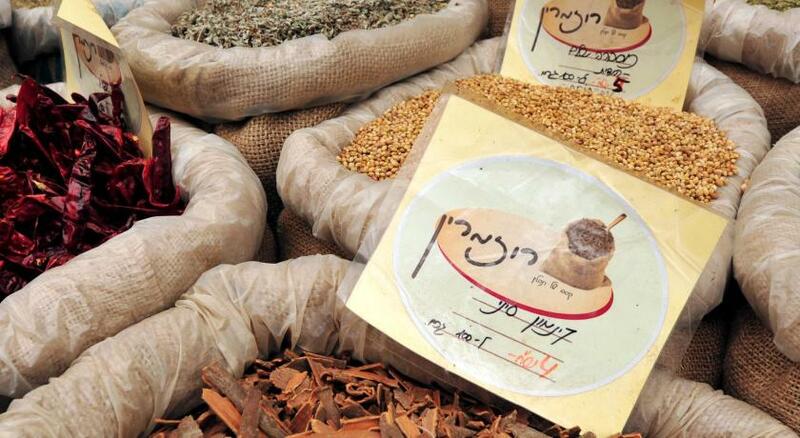 Please note that Abraham Hostel Jerusalem is not Kosher. Please note that guests of less than 18 years of age must be accompanied by their parents and cannot access dormitories. It is like a factory. Hundreds of tourists every day. Rooms have no any character, just few beds and that is all. yOU HAD CHARGING FACILITIES IN THE LOBBY FOR CHARGING ELECTRONICS; STORAGE FOR LUGGAGE AHEAD OF BOOK IN TIME; EASE OF BOOKING IN; AND GREAT ACCESS TO REST OF Jerusalem; AND BOOKED ACCURATELY ALL THE WAY FROM THE CENTER OF n America Winnipeg, Manitoba, cANADA, AND HAVING YOUR TOIUR COMPANY ON SITE ALLOWED ACCESS TO PROVIDE ANSWERS AS TO ALTERNATIVES OF HOW TO GET FROM POINTS TO OTHER AREAS OF Jerusalem AND Israel. looking FWD TO YOUR NEXT LOCATIONS THAT WE can use as well. When back! Size of the first room we stayed in. As I mentioned before the hostel is actually pretty big and so in my opinion it lost a bit of the hostel character and feeling. There are a lot of people so for the staff it’s almost impossible to get in touch with all the people. Totally understandable and they were also very kind and answered every question in a good but pretty short way. The location of the hostel is amazing and couldn’t be better. It’s really easy to get to the central station and to the city center. Breakfast was good and it was also really quite for such a big hostel - especially during the night. Found nothing which could be improved. The air is young in Abraham Hostel. Consequence of the dynamism and friendliness of all personnel rather than of the age of guests (in fact, a wide spectrum of visitors' ages!) From the very first moment you fell welcome and accepted into the "club". 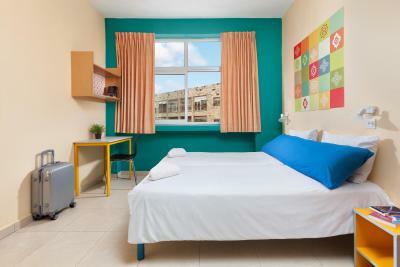 Individual rooms are relatively simple but comfortable and spacious: everything works and no important details are missing (a table, fridge, a.c./heating, large closet, bed lamp, hanger for the coat + backpack, even a hook for towels is on the right place). Reception offers all sort of useful services: SIM card, the card-pass for the "light rail" (tramway), including its recharging. At the tour desk you obtain detailed advice for visits in Jerusalem and can book various day trips to places around and near the town. The "common room" and guest kitchen offer a comfortable space for sitting and preparing or contemplating the travel, and the bar (serving beer, wine, sodas, small meals) is another important point of attraction, stimulating contacts between the guests. 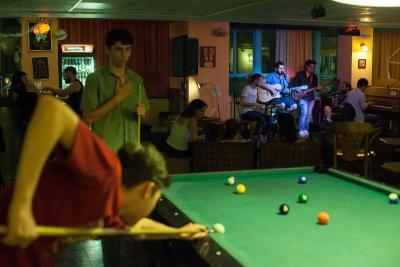 The hostel also organizes every day cultural programs and various courses. I will surely stay here and nowhere else at my next visit to Jerusalem. Very clean, nice events in the evening (the Shabbat dinner was great), helpful staff, and great - vegan-friendly - breakfast.